After several weeks of deliberations and, consultation with experts from the design and 3D printing world, Array is ready to reveal the winners of the 3D design challenge. This challenge took place across several offices and culminated in a collaborative effort to bring 2D drawings to 3D reality. The participants committed to not only creating unique business card holder designs, but to spending their own time adjusting, tweaking and testing virtual models and 3D test prints before their complex designs were ready for judging. Array Architects is pleased to announce the third place winner of this year’s 3D contest. Eric Ho, an interior designer in Array’s New York City office, garnered much praise from the judges for his complex design. “My business card hold is literally and figuratively ‘held’ together by our logo. When we rolled out our new brand last year, I knew I loved it for its simplicity as well as timelessness,” remarked Eric. 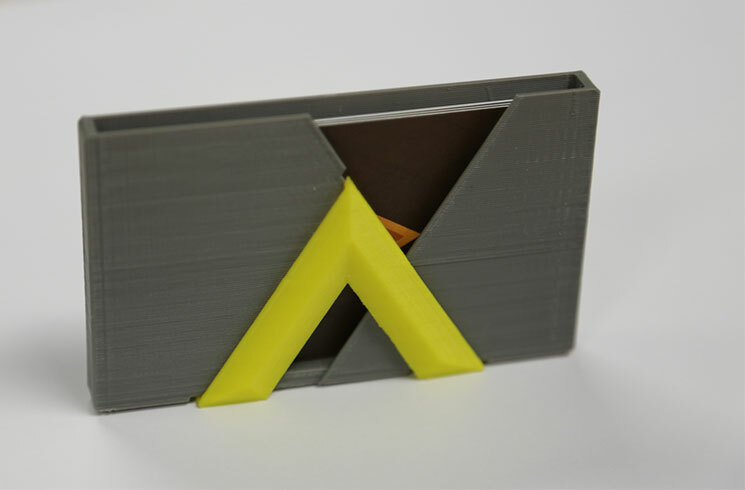 Internal and outside judges agreed that this model was the ‘most practical and repeatable solution.’ The card holder’s simple design boldly embraced the firm’s logo and brand, incorporated the logo colors well and fit the design of Array’s business cards. Capturing second place honors is Natalie Amodei, an architectural intern from the firm’s Philadelphia office. Natalie’s model captured the Array brand succinctly, and she successfully conquered the complexities of the printing medium and drew out the best the MakerBot has to offer. 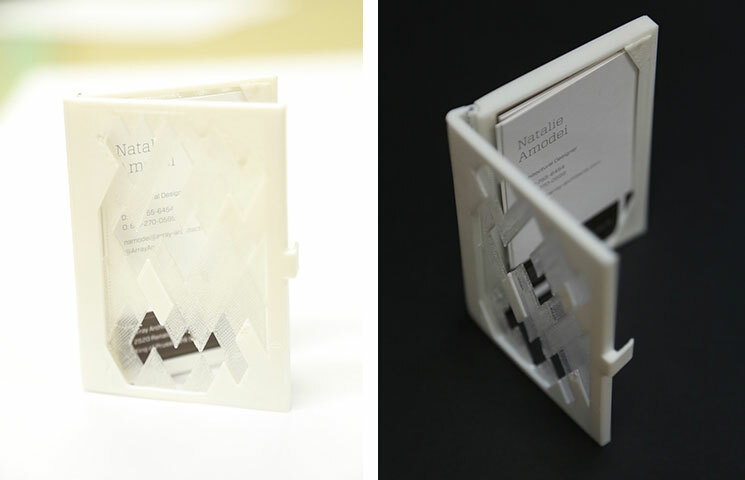 The first place award for her dramatic design of a 3D-printed business card holder goes to Julia Savastinuk, an architect in Array’s New York City office. “I wanted to capture progressive movement and change with a dynamic model. Array is extending up and outward while maintaining a strong foundation, expressing change and growth. The cards, held in the ‘architects’ portion, are seen through the layers which peel off of the Array logo,” states Julia of her winning entry. This model was noted as being, “A beautiful object that was a pleasure to look at.” Julia’s model best captured the intricacies that are possible with today’s desktop 3D printers. The height and detail she was able to obtain is a testament to her design capabilities, her structural intuition and her embracing of Array’s brand. Want to read about all the 3D Makerbot submissions? Click here to read Tony’s first two installments.